Bad oral health may not be one of the complications that you immediately associate with diabetes, but there definitely is a link between the two. According to studies, having diabetes can increase your chances of having gum diseases. But luckily, people who have the metabolic disease aren’t immediately destined to have red and swollen gums. Good dental hygiene has a lot to do with warding off periodontal diseases. Diabetes may not only make your blood a few times sweeter than other people’s; it can also lead to longer healing time of wounds incurred after a dental surgery, increased propensity for having fungal infections, dry mouth and cavity formation. The reason for why diabetic patients are susceptible to so many oral conditions has something to do with their compromised immune systems; this means that they cannot fight off infections much readily than non-diabetic people do, and gingivitis is just one of the infections that diabetic people are at high risk for. The mild inflammation of the gums is known as gingivitis where the gums appear red, swollen and have an easy tendency to bleed. Bleeding often happens when one is brushing or flossing especially when doing both very vigorously. 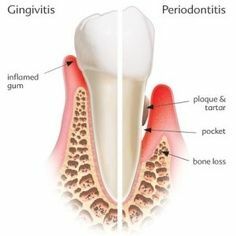 When gingivitis is left untreated for a considerable period of time, pockets start to form along the gum line of sufferers. These pockets are spaces in between the gums and the teeth where tartar had once accumulated. Tartar is that mineral-like substance that forms along the gum line and is the product of plaque accumulation. If we follow the flow properly, it is integral for individuals to keep their pearly whites free from plaque, especially those with diabetes. One direct consequence of gingivitis is receding gums which can expose the root of your teeth. This can usher in conditions like teeth sensitivity as well as other accelerated tooth decay because the roots of our teeth are not covered with enamel, the hard protective covering of teeth. The procedure which can reverse the effects of receding gums is pocket depth reduction. With pocket depth reduction, a peridontologist folds back gum tissue and then cleans out the region of any bacteria left behind which has induced the infection. To cap the entire procedure, the periodontologist pulls up the gums and secures the tissue snugly against the teeth to remove the pockets or spaces. While this procedure can reverse the effects of gingivitis, people with diabetes have slower healing time which is another complication that diabetics must wrestle through.